Olexander Scherba was born in Kyiv in 1970. 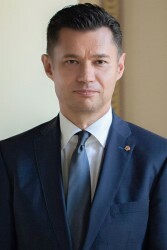 He has been Ukraine’s ambassador to Austria since November 2014. He was ambassador-at-large in the Ministry of Foreign Affairs (2010-2013), adviser to the first vice prime minister of Ukraine in 2013-2014, and an adviser to Arseniy Yatseniuk during his presidential bid for the 2010 election. This article includes a total of 488 words.